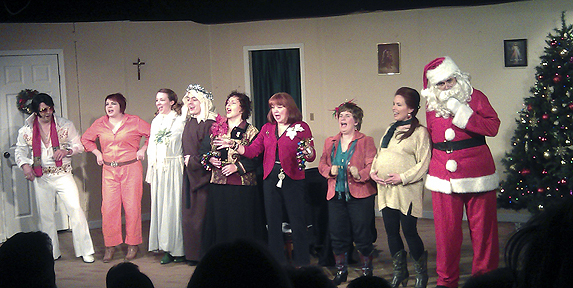 I just attended a new holiday comedy, Christmas Belles, at Edmonds’ Phoenix Theater. How can you go wrong with a Texas-themed comedy about an Elvis impersonator, female arsonist, accidental Vicodin usage and green cowgirl boots? The play is the second installment in the Fayro, Texas (pop. 3,003) comedic trilogy by Jessie Jones, Nicholas Hope and Jamie Wooten. Several members of this cast, Niven included, appeared last spring in Woodinville Repertory Theater’s production of the first play in the series, Dearly Beloved, and are enjoying the opportunity to work with old friends and new in carrying this zany “sisters Futrelle” saga forward. 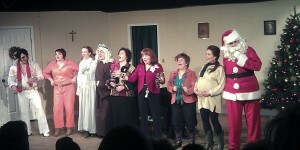 The cohesion of the talented cast is truly enjoyable to watch. “I’ve attended previous, consistently excellent plays at The Phoenix Theater, and it’s an honor now to tread the boards in this place committed to illuminate our common humanity and develop a fundamental appreciation for the magic of live theater,” Niven said. Okay, so humanity and all that. The best reason to attend this hilarious holiday treat: boots galore. Did I mention the green cowgirl boots on the Virgin Mary? See it, y’all!